Fructose is a natural sugar present in our diet in its free form (in fruits, honey, etc.) or bound to glucose (in sucrose). Unlike glucose, fructose cannot be used directly as an energy source by most cells of our body and needs first to be processed into glucose, lactate or fatty acids in splanchnic tissues (enterocytes, hepatocytes, kidney proximal tubule cells). These cells express specific fructolytic enzymes as well as gluconeogenic enzymes, glucose-6-phosphatase and lipogenic enzymes. Fructose exerts mainly anabolic effects in splanchnic tissue. Glucose and fructose are almost invariably ingested together and synergistically stimulate gut hexose absorption and hepatic glucose metabolism, resulting in improved hepatic energy storage. 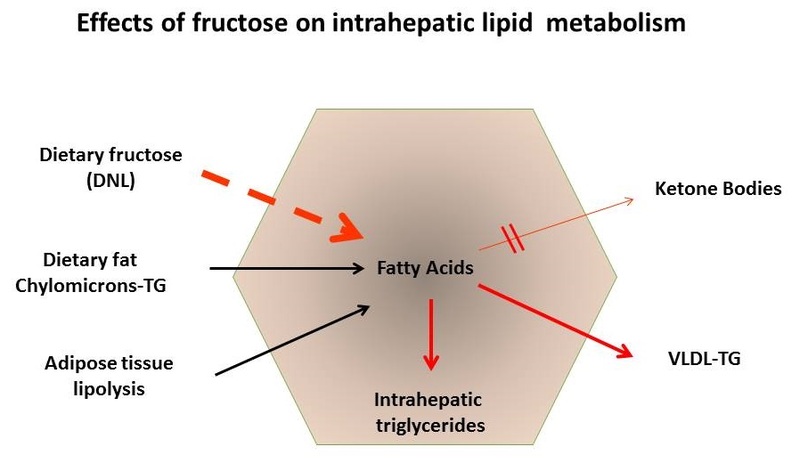 Fructose also stimulates de novo lipogenesis, resulting in ‘hepatocentric’ fat storage (i.e. fat storage from VLDL-TG rather than chylomicrons). These specific features of fructose metabolism make it a nutrient well suited for energy replenishment (e.g. after exercise) or seasonal energy storage (e.g. before hibernation or migration). However, this two-step metabolism also accounts for an increased endogenous glucose production/hepatic insulin resistance, hypertriglyceridemia, and increased intrahepatic fat content when fructose is continuously consumed in large amounts in individuals with low physical activity. These effects may in the long term be associated with an increased risk of developing metabolic diseases.